Welcome to eZee Insider, your monthly gateway into all things eZee. In this edition, learn how hotel chains can benefit from CRS in eZee Reservation. Watch and learn eZee Absolute from the new tutorial website section and eZee's YouTube Channel and much more. 2014 starts off with a bang in Malaysia with official launch of "Visit Malaysia 2014", Malaysia's biggest tourism celebrations. This will be Malaysia's fourth edition of the event after three previous celebrations in 1990, 1994, and 2007.
of year-long events and festivals. The event aims to attract more than 28 million tourists from around the worlds with 76 million MYR in tourism receipts. In 2014, Malaysia will be host to more than 50 mega events and 200 exciting events and festivals spread out through the year. This event will give a substantial boost to the tourism industry in the country and further highlight Asia has one of the top tourist regions in the world. eZee looks forward in supporting its clientele in the region during the celebratory year and further strengthen our relationships with our partners. Special events such as the color of 1Malaysia, an annual event highlighting country's diverse culture, F1 Grand Prix in Sepang, and rainforest music festival in Sarawak will give tourists various opportunities to experience Malaysia like never before. eZee Malaysia will be there 24X7 supporting its clients and resellers in the eventful year. eZee Reservation as their online booking engine with eZee Centrix as their channel Manager. eZee Absolute is being used by all the properties as their property management solution which will provide them flexibility, accessibility and CRS which will give the management total overview on bookings coming from different sources at all the locations. eZee Reservation with eZee Centrix will give them control over their online bookings and online distribution. eZee Centrix with more than 60 plus distribution channels gives them advantage of choosing the best combination of channels and changing their online strategy according to the market conditions. Solutions with seamless integration between them, eZee products provide Cuba chain of hotels a consistent experience and achieve higher efficiency in their day-to-day operations. Over the years the hospitality industry has successfully implemented various reservation systems and online bookings have never been easier as guests are able to book with their favorite hotel online with few clicks of a mouse. Given the multitude of online revenue opportunities, hotels often don't pay enough attention to their own booking engine on the website. This should be the primary source of revenue for the hotels. eZee Reservation, online booking engine from eZee provides all the tools and features required by a hotel through which the guests can easily book their stay. Central Reservation System (CRS), a brand new feature in eZee Reservation will allow hotel chains to easily switch between all the connected hotel locations and view the booking status individually. In addition, CRS will allow for easy management of room bookings across different locations and do phone bookings with ease. 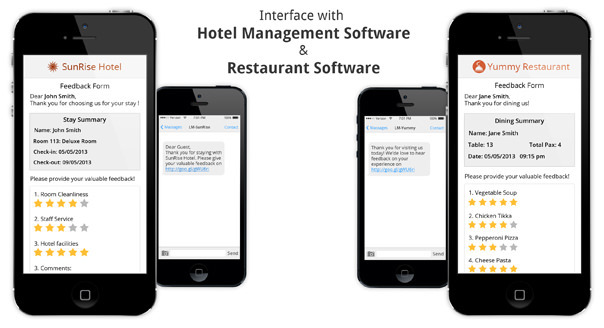 Specifically designed and developed for hotel chains, this feature brings distinct advantage to hotel groups or independent chain of hotels. 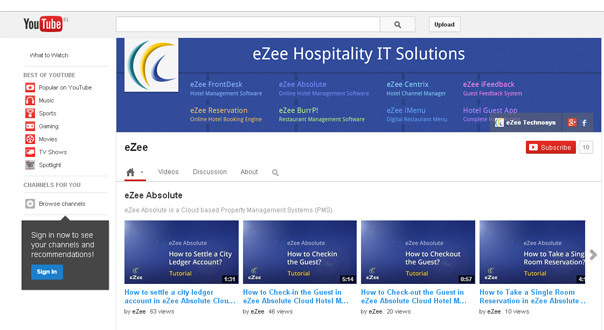 We have just launched our first video tutorial section for eZee Absolute. The videos will highlight how easy it is to do daily operations in the system and other benefits it offers. The same videos can also be found on eZee's new YouTube Channel which can be shared with the colleagues. We plan to release more video tutorials as time goes for other products giving us a great opportunity to highlight what eZee product has to offer which often goes unnoticed. Follow the video tutorials section on the eZee Absolute website or YouTube Channel and we look forward to your opinions and feedback on it. To check the video section, please visit www.ezeeabsolute.com or the YouTube Channel today. Customer feedback software from eZee Technosys, eZee iFeedback gives your hotel and restaurant the tools through which you can effectively collect reviews, opinions or any data that is important to your business. As each of the eZee products are developed and have seamless integration with each other, eZee iFeedback is no different with complete integration with PMS and POS. This intuitive model simplifies all aspects of the system and makes it easier for hotel to share one central database where the entire customer's information is stored. This gives another key advantage for hotels and restaurants as well as their customers, as the data is shared across the systems it gives the ability to generate prefilled survey forms with all the important details. In addition, once the system is in place it will automatically start sending out surveys and collecting daily feedback without any staff supervision bringing no extra cost for the hotel. This gives an extra edge to the management as they know exactly what services were offered to which customers and what the guest experienced. Data collected from different surveys makes it easier for the hotels to analyze the data and make the right changes accordingly. The prefilled forms is also advantageous for the guests, as they do not have to spend time filling the information again and it gives them a more personalized feel for each of the survey they take compelling them to be more honest in their feedback. 2013 was the year when people using internet on their mobile phone outnumbered the people using internet on personal computers. Connecting with customers will be easier and faster that it has ever been. Hospitality industry has already been experiencing the trend for last couple of years with rise of mobile booking engine, mobile friendly websites and custom hotel apps. In 2014, custom hotel apps and other travel apps will be leading charge when it comes to researching, planning, and booking a holiday. With majority of the travelers now using smart phones, it has become imperative for the hotel to have a mobile app. Travelers have become so accustomed to variety travel apps on their smart phones that they naturally expect hotels to have one as well. This is a great opportunity for the hotels where they can have total control over their content as well as engagement with guests is more personalized. Hotels can control and transfer huge amounts of data directly to their guests via video sections showing events and updating gallery showing new amenities in the hotel. 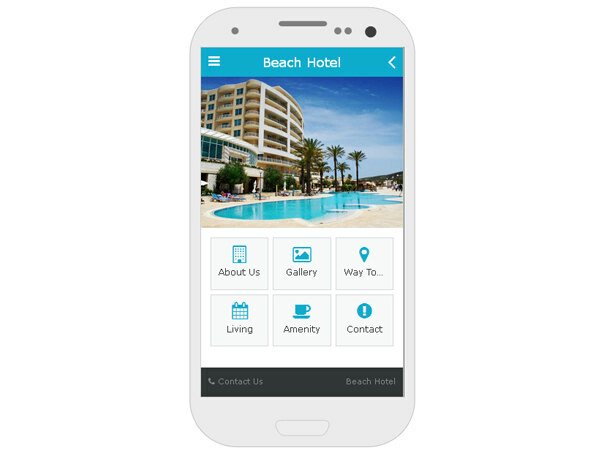 Mobile App makes it very easy for the customers to do bookings, connect with the hotel, find out directions with geo tagging and continuously keep in touch with their favorite hotel. This provides amazing opportunity for the hotels to engage their clients directly. Hotels can collect huge amount of data when it comes to understanding their guest's behavior without having to do major survey campaigns. This is crucial as the new generations of users offer a new behavioral pattern which is constantly evolving and Application can be the main tool through which a hotel can understand that change.